The other night, my hubby and I snuggled down to have some quiet time in front of the TV when it occurred to us that the closed captioning feature was activated on one of the channels. As we fiddled with the remote, I began to wonder: How do all the shows and movies get these captions? Better yet, is this a potential job opportunity that would allow me to work-from-home? A little research and to my surprise, the answer was YES! Not only can you work-from-home watching classic TV shows, movies, and educational videos, many of these closed captioning positions also pay well. Talk about a win-win. 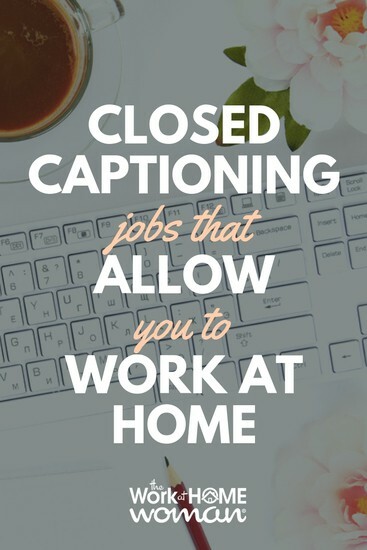 Where can you find these fantastic closed captioning jobs that allow you to work-from-home? No worries, we’ve done the research and the work for you. Below, we’ve found some of the best companies hiring right now for closed captioning jobs that allow you to work-at-home. 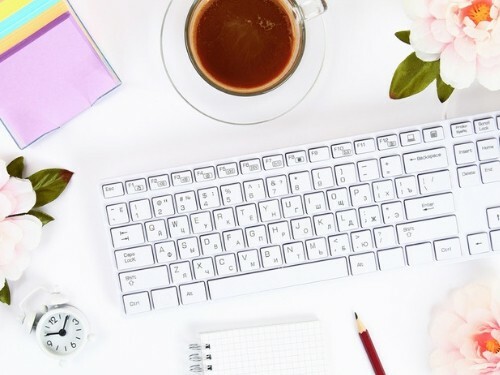 Before we dive into where you can find captioning jobs that allow you to work-at-home, we thought it might be helpful to get a quick overview of what closed captioning entails and what you could be working on in this position. You might already know that closed captioning are those descriptions that appear at the bottom of a TV screen during a show or movie. These captions help individuals understand the content of the program. As a captioner, you’ll watch shows or videos (how fun is that?!) and type what you hear. You should be comfortable with working on a computer and typing accurately and quickly as well. Some captioners can type around 200wpm! Aside from these qualifications, you will need a reliable internet connection and headphones. Check the equipment requirements before applying to ensure you have what you’ll need to be successful as a captioner with the company. Offline captioners are what many of the companies below are wanting. These transcribers caption pre-recorded TV shows, movies, or videos. If the program isn’t “live” on-the-air, it’s noted as offline captioning. This position offers the most flexibility, allowing you to set your schedule since the shows are prerecorded. Real-time captioners, as you may have already guessed, provide captioning to live broadcasts. Think of talk shows, sports shows, newscasts, etc. These positions require that you type a certain word per minute and can be a bit more technical. Some companies provide training or a “practice run” prior to hiring. Most companies hire remotely for these positions which make these captioning jobs the perfect work at home opportunity. Ready to earn some cash watching TV? Sounds crazy, I know, but believe me, it’s all true! Check out these companies hiring captioners below. This is one of the more popular closed captioning sites. Their application is straightforward, and you can apply to multiple positions under the “captioning” umbrella. Positions on Rev include transcriptionist, captioner, subtitler, and translator positions. Each of these positions has its town application process so apply to one or all of them; with so many options, you could be earning money in less than 48 hours! Aside from the great captioner position available, this company just looks like a fun place to work. They clearly embrace the idea of mixing business with pleasure and the overall company culture seems warm and inviting. Be sure to check out this opportunity but also investigate their other positions posted. Along with their current freelancer and internal positions, TransPerfect has a general freelancer application so you can register with the company for current and upcoming positions. This company hires real-time and offline captioners. Positions are always changing, so if there isn’t a position currently, bookmark the page! To apply as a captioner with Captionmax, you will need some experience (typically 1-2 years). Read through the requirements to see if it’s a good fit for you, and then press that “apply now” button. Looking for More Closed Captioning Positions? Try These! As a work-at-home mom, I’ve dipped onto job boards here and there to investigate companies that might be hiring. If you’re seeking closed captioning work, online job boards and are another great place to look! Several companies seek closed captioners and often post only to job boards. Simply type in “closed captioning” or “transcriber” in the search section and voila! A list of possibilities. Check out these awesome boards for closed captioning jobs at home and let us know what you find. Finding closed captioning jobs that allow you to work-at-home (remember you could work more than one! ), can be a rewarding and stable source of income. If you love to type, like watching movies and videos (um who doesn’t? ), and enjoy flexible scheduling, then closed captioning jobs are the way to go. Did you check out any of these positions? Score a job? Have questions about these jobs? Let us know below! I just clicked on it and it worked for me. Maybe their site was temporarily down? Great info. I had forgotten about this income source. Years ago I worked as a transcriptionist for a telephone relay service for the hard of hearing so perhaps that skill set would be helpful. Will definitely look into it. Awesome Loretta! Have you gotten the chance to look into it further? Good luck with your work at home journey. Sounds like you already have some experience in this field! I work for VITAC as a remote real-time voice captioner. I use speech recognition software to produce my captions. It’s a difficult yet fulfilling line of work. I caption news broadcasts, TV shows, sporting events, church services and more for stations across the country. I learn something new everyday. That’s amazing! You caption so many different broadcasts! Is one broadcast “easier” to caption versus another? How long have you been in this line of work? Which speech recognition software do you use to produce captions? That’s great that you’re interested in these closed captioning jobs! Check out the ones we have listed as they’re each a little different. Let me know what you’ve checked out and if we can help in anyway! Thanks for checking out the article! Happy to hear that you’re interested in these opportunities! Did you happen to check out any of the sites suggested in the article? Let us know if you do and if we can help out at all! Good Luck in your journey! Awesome! These jobs, I think, are sometimes overlooked and they’re certainly a great spot for making some extra cash! Do you have experience in this field? Have you tried one or more of the sites listed above? Let us know about your experience and if you have any questions! Interested in at home typing jobs. Thanks for checking out the article! Happy to hear that this has struck a chord with you! Did you check out any of the sites we listed above? Let us know if we can help you out at all! I totally get it! There are so many opportunities now for making money from home. I had NO idea about this venture until I researched it! These close captioning jobs can definitely put some extra cash in your wallet and if you love typing…they’re a win-win! Have you checked out any of the sites listed above? One of my personal favorites is Rev (because I like the variety offered) but each of them has their own benefits. Happy to hear you’re interested! Have you checked any of the sites we listed above? Let us know if you have any questions!